Sorry guys I am a little late on my recap. This past week’s episode was another one focused on the character development of one part of the group, mainly Abraham and Eugene. Thus far, all we really know about them is that they have traveled from Houston to Georgia and are on their way to Washington, where they plan on delivering Eugene who has the cure for all that is ailing the world. From day one, we have all been seriously suspicious of Eugene, he doesn’t give much info about the cure and keeps on saying it is classified information. 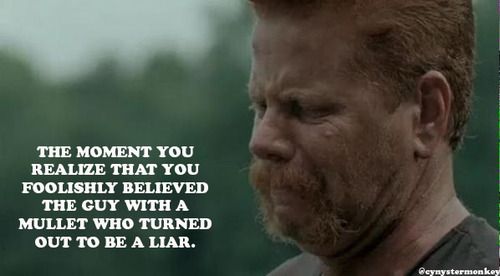 Abraham appears to be the type of guy we can trust, he doesn’t seem like someone who would just fight for anyone. Not many have really questioned them or tried to call their bluff, I mean would you? 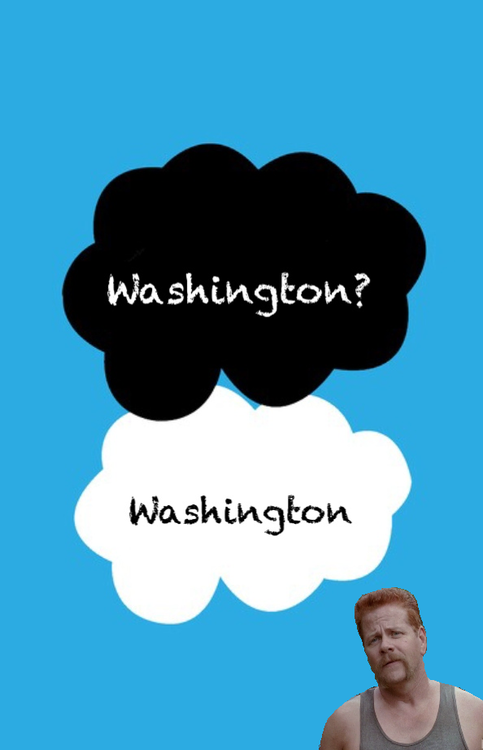 Abraham is a force to be reckoned with and has been so set on going to Washington and really the crew hasn’t had time to dissect their story with everything that has been happening. 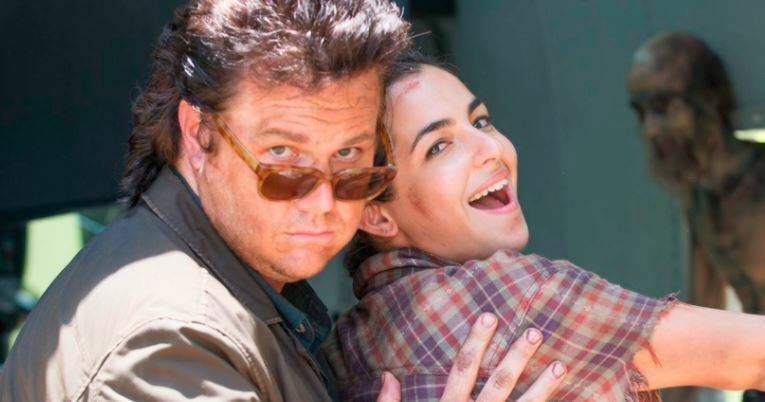 If you remember from the Bob episode, Glenn, Maggie and Tara agreed to travel with Abraham, Eugene and Rosita to Washington and agreed the rest would catch up to them later. Now that we got that out of the way, let’s talk about what happened. On the bus ride, we start to get the unveiling of the stories behind Abraham and Eugene. Tara keeps bugging Eugene about the cure and telling him he should cut off his mullet. Eugene is dead set on not cutting his hair and he makes that known to everyone. In other words do not touch the mullet! All of a sudden the bus starts to veer out of control and it goes spinning and flying in the air and crashes on the side of the road. From the outside, they can see the walkers are coming and are all around them. Tara gives Eugene a pep talk and tells him he needs to be strong and he needs to kill. As we know so far, Eugene has been the worst at killing walkers, it’s almost as if he doesn’t know what to do with himself when he is near one. He’s like a virgin on prom night. The others go out to fight and then a walker peeks its’ head through the window and Tara saves Eugene from the walkers. At one point outside, Tara is about to get whacked and Eugene saves her. This act of killing leaves him shaken and confused. Now they have no bus and are trying to decide what to do. Eugene suggests they go back to camp, but of course Abraham refuses. They decide to press forward and look for supplies. They find a library that looks almost untouched. Glenn and Abe have a heart to heart about everything and he tells him that “everyone who is alive is strong now” and “strong enough that they can kill you.” He knows that they people they encounter out there who are alive are just as dangerous, if not more than the walkers. Once inside they heat up toilet water to drink and settle in. We see Glenn and Maggie cuddling together, we really haven’t seen them be intimate in a long time and she tells him she feels guilty for relaxing. Then we see Abe and Rosita getting it on. I guess everyone still gets horny regardless if there is a zombie apocalypse going on outside. From the corner of the room, Rosita can see that Eugene is watching them and he is back behind the books staring like a perv. Tara catches him and tells him to stop, he tells her he is watching because he likes to look at the female form. Clue number 500 that he is truly a weirdo. Tara being the good social worker that she is pries even deeper into Eugene. He admits to her that he put glass in the bus and he caused it to crash. WTF! He believes that if he didn’t have the cure, then they would never bother to save him and they would probably kill him. She disagrees with him, but his insecurities over being weak have caused him to believe that in this society he is worthless and better off dead. Tara promises to keep his secret safe, but really knowing that he put everyone’s life in danger is unnerving. Another part of this episode that continued throughout were flashbacks from Abraham’s life. We see that he had a wife and two kids, but they were afraid of him. He killed a lot of people and left her worried and afraid and she ran from him. When he finally goes out into the world, he realizes he is alone and becomes overcome with grief and wants to take his life. He gets ready, puts the gun to his mouth, but then in the distance hears someone screaming for help. It is Eugene and he saves him and in that moment they become a team. Eugene tells him he has the cure and that he has to help him. Now we know that Abraham never really questioned him and put his full faith in him because at that time he needed a mission, he desperately needed something to believe in. 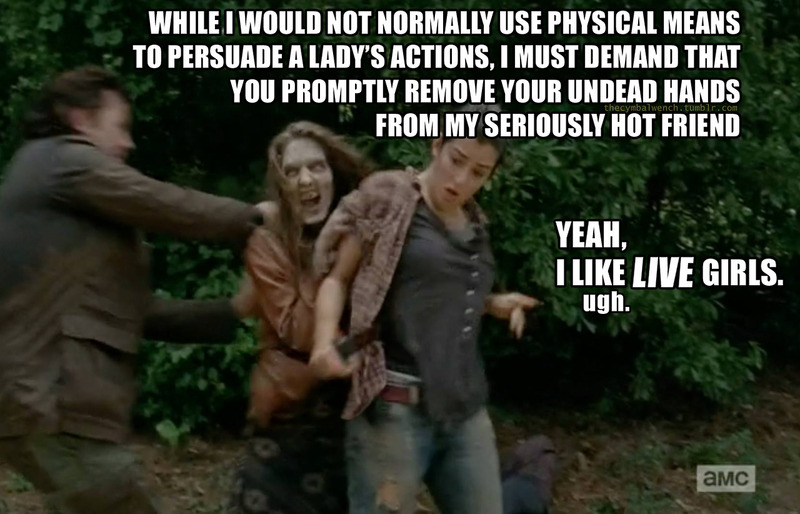 We see Rosita and Abe get in a bit of an argument. He wants to leave, he is determined not to stop on his way to Washington, he thinks they will never get there if they continue to do this. Meanwhile he has a gaping wound on his hand that is lingering and somewhat festering. They focused a lot on this wound. Does this mean something? They decide to stay and forge for supplies since they have run out of toilet water. Woo hoo, jackpot, they find a fire engine! Fully equipped with water and able to take down walkers in a single hit. The problem though is that it was probably used for that in the past and now parts of it are gunked up with walker goo. They decide to try to fix it and in doing so, all of a sudden a huge group of walkers comes storming on them. Eugene grabs the fire house and starts blasting the hell out of the walkers. He knocks them all out. Who knew that water destroyed walkers? Bueller… Bueller? Since when is this a way to kill walkers, does anyone know the answer? From the top we can see that written in blood it says “sick inside let them die.” This just serves as a reminder that there are always remnants of fear in every town they encounter. Once they fix the fire engine, they hop and decide to get on the road. Did someone say road trip?! On their way they see in the distance massive amounts of walkers in the farm lands. The group suggests taking a detour, but Abraham is relentless, he wants to go through them. Glenn tries to reason with him, but he is beyond all control. Abraham doesn’t want to waste any more time. Everyone starts to yell at each other and bicker and all of a sudden Eugene goes cray cray. Then this is when the bomb drops, Eugene admits that he does not have the cure, he is not a scientist and he tells them he cheated people into taking him there. He believes that there will be help in Washington and that is what gave him the idea to go there. This sends Abraham into a tizzy and he rightfully so punches him in the face. The punch literally lands him face down on the ground. 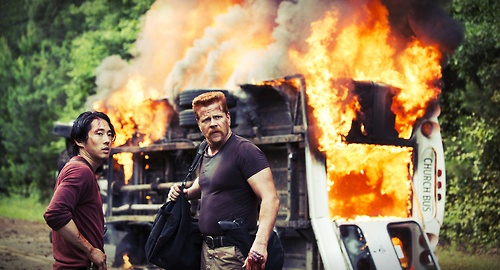 I think that was the moment when Abraham realized he has been a fool all this time for listening to Eugene. He was duped, he let his sense of having a mission get in the way with reality and his judgment. Where can this group from there? 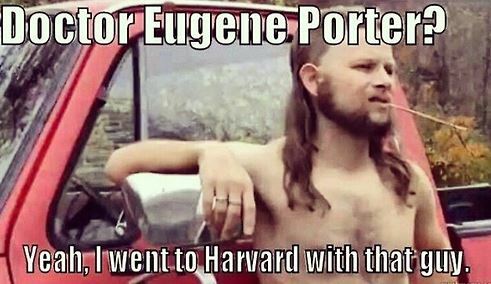 Will they accept Eugene back into the fold after this revelation? What did you guys think of this episode? Did you ever believe Eugene really had the cure? I really enjoyed this episode and eventhough I was surprised by the whole Eugene revelation, I knew deep down that something wasn’t right there. Thanks Rob! Yes that is the big question. They really cant trust him now but at the same time maybe that is what he felt he had to do survive out there. But he should not have let that lie go on for so long! I was pretty disappointed with this episode. I’ve not really cared about mullet boy & James Hetfield & their little group so I was disappointed as soon as I realized the episode would focus on just them. I don’t know… Just get back to the main characters we care above! 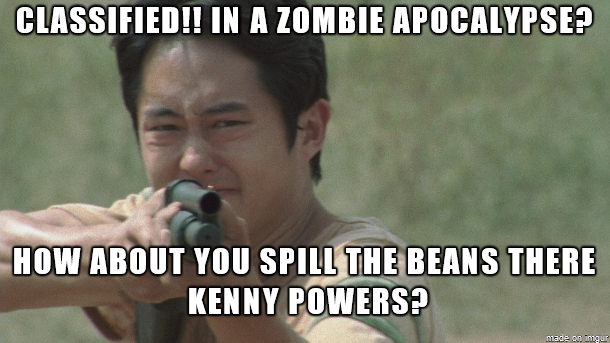 At least Glenn was in this – he’s probably my favorite.